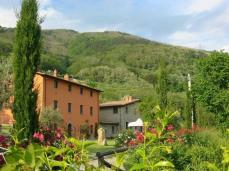 Set in Matraia in Lucca, Tuscany, Apartment Michela is one of the best tourist apartments in Tuscany. Be it the place it is located or the comfort it offers, all are sure to catch your fancy! Apartment Michela resides in Casale Silvia, whose main apartment and its adjoining building were converted into four holiday houses. Offers a sweet romantic stay! The olive groves, wonderful panorama, soaring cypress trees, misleading pathways are its drawing cards. This classy, chic apartment is modelled to fit a family of two – even more perfect for honeymooners! Each and every corner of the rooms is neatly partitioned, without clumsiness. The living room along with the dining room has sofas, fireplace, dining table, a satellite TV, wall hangings, portraits, on their perfect places. There is a double bedroom with a matrimonial bed and an attached en suite bathroom with shower feature. Though small, the kitchen is supplied with a dishwasher, over, fridge and freezer. In case you plan your trip along with your friends group of four, you can rent out Apartment Michela’s nearby apartment along. The garden area has rare plants and appears lush green all around. Some of its attractions are the swimming pool, play area for children, solarium, an antique stone fountain, and barbeque. 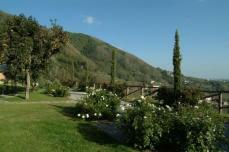 Exclusive for the guests are the mountain biking that is organized inside the casale Silvia’s estate. 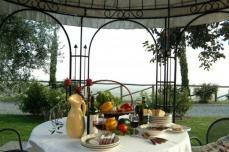 You can also excite your evenings and mornings by jaunting in the woods, vineyards and olive groves. The apartment’s south facing feature makes it all more pleasant for your winter breaks! Enough Said, now this should be your next tourist spot! For all those who would prefer more, this apartment’s surrounding can be bewitching. It is crowded with medieval churches, monumental villas, farm and woodland. There is also “Strada del Vino”, which is a route that leads to the exact wine production area. Also enrich by heading to the Apuana Alps, Appeninies, beach of Versilia, and places of historic interest including Lucca, Pisa, and Florence that are cuddled up near this supreme apartment!